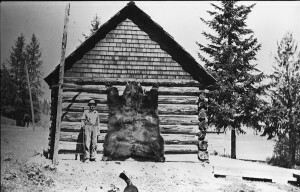 14-year old Chris Hamling Jr. with the massive grizzly he shot, c. 1920. Walter Scott had a spare horse that was getting old and needed to be put down. He asked young Chris Hamling if he would do the job for him. Chris thought it would be a grand opportunity to use the carcass for bait to get some fur bearing animals; so he took the horse along the track to the south end of Box Lake and disposed of it near the swamp. The bait worked well, and three coyotes were brought in that winter. Next spring, he decided to check to see if any bear had been attracted to the bait. A big cedar windfall had come down and lodged against another tree. This provided a path for Chris to inspect the remains. Between two trees, he could see the fur of the belly of a bear but the head and rear were obscured. Apparently, the bear had dragged the horse under the fallen tree. From this angle Chris thought he could hit the bear in the heart with his 38-55 rifle. Carefully sighting, he pulled the trigger. The bear went straight up in the air and let out a great war-hoop! Before he hit the ground, Chris shot again and broke the bear’s neck. Undaunted, the bear clawed and scratched in an attempt to reach Chris but he couldn’t lift his head. Chris kept pumping shells into him until bruin finally stopped. Chris remained still for several minutes, then grabbed a long dry stick, reached out and poked the bear. The animal didn’t move so he packed up and returned home. His dad laughed and got the lantern. “Just because you shot him, doesn’t mean he’s that big.” On arriving at the scene, Chris’ dad told him to tie the rope around the leg of the bear so that they could pull it out of the mud hole he was in. They pulled but all this did was raise the leg. The bear didn’t move an inch. “Chris, give me the lantern, I want to see what we’ve got here.” All of a sudden, he shouted, “My God, that’s a grizzly! Let’s get out of here. There might be another one around!” Chris stumbled over the stumps and roots in an effort to keep up with his dad who was running to the boat. The next day, armed with rope, blocks and a gun, Chris, his dad and Jack Wensley returned to the scene. They raised the bear and skinned it right there. The wounds were quite obvious now and so was the apparent condition of Chris during the encounter. He had shot eight times at the creature, one hit the bear’s neck, one his heart and one went through his paw. Such was a boy’s lesson in the wilds; Chris was only 14 at the time!